A Chesapeake Bay dune classification system was developed with three main categories that attempt to describe dune system genesis; these are Natural, Man-influenced and Man-made. Additional site parameters measured include: fetch exposure, shore orientation, nearshore gradient, morphologic setting, relative stability, geologic underpinnings, shore structures influence, and ownership. Dune morphology in the cross-shore direction is described by beach and dune profiles. For this project, representative profiles were taken at most sites. All profiles have a MLW water position and a primary dune crest position. The position of the primary dune crest is pivotal in describing the morphology of the primary and secondary dune elements. The dune morphology, in conjunction with the wind/wave exposure, adequately display the nature of a given dune site. 3) conducive onshore wind/wave climate. Deposited sand must remain above a stable backshore to allow dune vegetation to become established. Each dune documented in the 2001 report has its own history of change -- growth and decay; natural and anthropogenic. Many miles of natural dunes have been altered by development, and many have been formed in response to processes altered by man's influence. 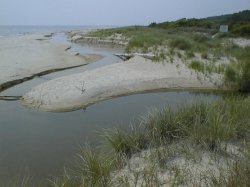 Dunes around the Chesapeake Bay estuarine system in the localities within the Act encompass only about 40 miles of shoreline. This is about 0.4% of the total Bay shore - making it an important, but rare, shore type. In the eight localities, 219 sites were determined to have jurisdictional primary sand dunes. Of the 219 sites surveyed, 165 were primary dune only sites and amounted to about 20 miles of coast. There were 54 sites that had secondary dunes amounting to about 20 miles of Bay coast. Almost three times the number of primary dune sites vs. primary/secondary sites exist. The average primary dune site is about 650 feet long whereas the average primary/secondary dune site is 1,884 feet long, usually as dune fields (dune feature greater than 500 feet alongshore). Primary dunes are more easily defined than secondary dunes. Generally, a primary dune crest can be identified in the field. The back or landward limit of the primary dune is more subjective because of the variability of the break in slope. The back of the primary dune also marks the front of the secondary dune as defined in this study. The crest of the secondary dune can be difficult to define in many cases due to linear variability of the crest ridge. The back of the secondary dune can be even more subjective and might end at the wood line rather than at a well-defined break in slope. Plant community structure can be used as an indicator of dune stability and history. Primary Bay dunes that are relatively stable generally have robust communities of American beachgrass, saltmeadow hay, and sea rocket. These species thrive in the hot, dry, and salty conditions associated with primary dunes. Conversely, dunes which have shrub communities or herbaceous species generally not characteristic of areas such as dunes that frequently encounter extremes of heat, dessication and salt may provide evidence of erosion or instability. For example, shrub communities are common in dune fields landward of primary dunes. Shrubs growing on primary dunes could indicate erosion through the primary dune into the secondary dune field. For each locality in the Dune Act, an inventory report was completed showing the status of the dune at the time of survey.